Pigs are how a farm stores surplus nutrients, and how non-human-grade nutrients are converted to forms of more value to the farm. 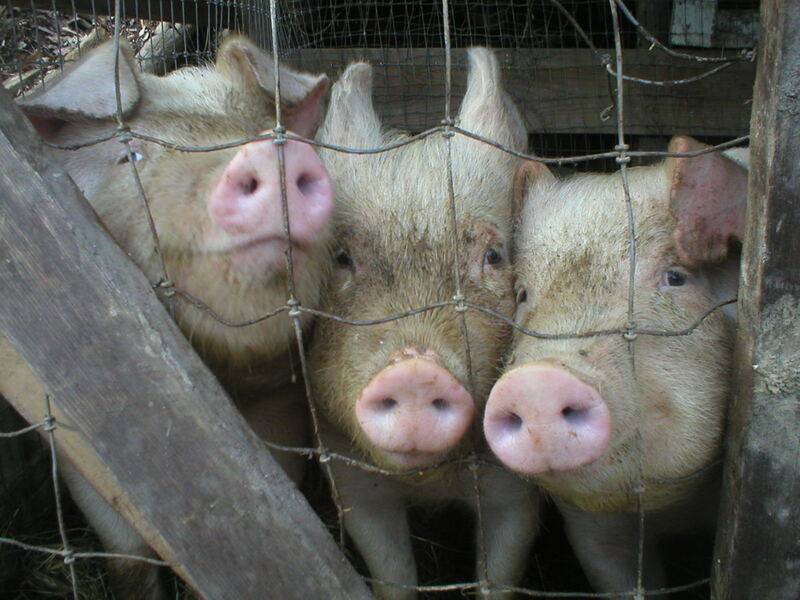 In plain language, farms need pigs to eat the garbage and turn it into bacon and piglets. For us, this means we need at least one or two pigs all year ’round, and usually we have at least four going. We feed them out until they get big — sometimes really big — or until we have a new set started — and then we butcher. Summer and fall, of course, generate the most surplus, dropping off as winter closes in, but never really drying up; there are always whey and buttermilk, rinds and hulls and seeds of things, carrot tops and potato water and so on. The summer hogs went into freezers — ours and the monastery’s — in September/October. Four little guys are bunking in the sty in the big barn now. With the late calves weaning and the consequent cheese and butter making, they are having a hard time keeping up with all the buttermilk and whey. The garden is still furnishing us with some bean haulms and perennial weeds to add greens to the pigs’ diet, and the poorer-grade hay we toss down to them is acceptable food before they turn it into bedding.